Devil’s Club in its spiny spring glory. In her delightful cookbook Shroom, Becky Selengut describes foragers as “a secretive and paranoid lot.” You can imagine my reaction, then, when we showed up at our intended foraging spot only to find another car parked there. After reading about harvesting Devil’s Club (Oplopanax horridus), I was curious to try it myself. We’d purchased salve, soap, and tea on a previous trip to Alaska, but why buy something you can make yourself, especially if it involves tromping through the woods followed by hours in the kitchen? Over Memorial Day weekend, we made the drive down to the hikes in Skagit County. In a rather unlikely turn of events, the hike we chose was not only completely deserted but also a plant lover’s paradise. 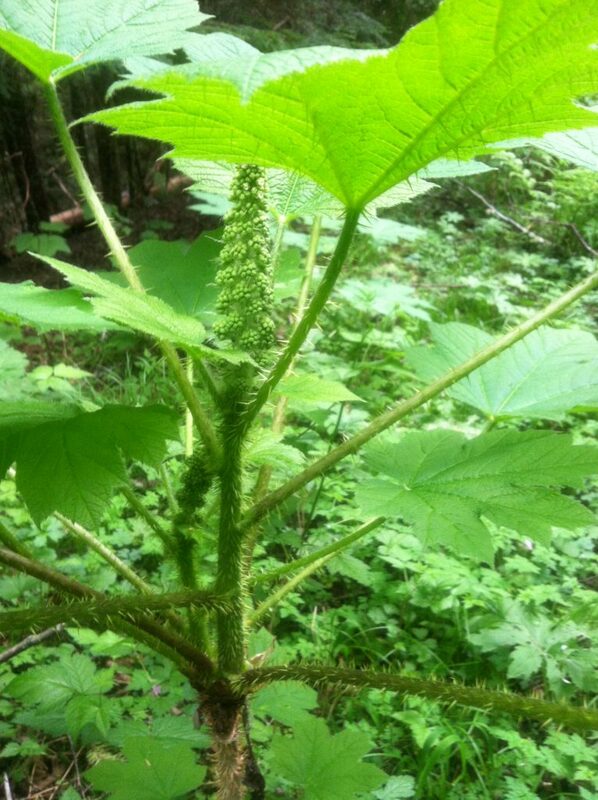 In addition to an abundance of ferns, wild ginger, and berries–ripe salmonberries and blueberries, with thimbleberries and currants to come–I found a patch of Devil’s Club that had been recently and severely trimmed by a group of trail workers. Although I’m sure the maintenance crew intended only kindness to their fellow hikers by clearing the path of the plants and their painful spines, it hurt my plant-loving heart to see the still-green foliage slashed on the ground. Given the cultural and medicinal importance attached to the plant, it seemed almost cruel to leave it lying there so lonely. Since the maintenance crew had left several roots exposed along the trail, I carefully cut out a portion and tucked the rest back into the duff. In his highly useful book on foraging, Douglas Deur advocates restraint in harvesting Devil’s Club because it grows slowly. It will, however, propagate from roots and stalks buried in damp ground. According to Pojar and Mackinnon, Devil’s Club favors disturbed spots within an otherwise healthy forest, which is exactly the sort of spot we found last weekend. Once I got the unwieldy, muddy roots home, I set to work cleaning off the brown outer bark and stripping the pale inner bark. I tore the flexible inner bark into strips and left them to dry overnight, then popped them in a barely heated oven the next morning. I’ve spent the rest of the week inhaling the lovely and slightly intoxicating scent of the drying root and anticipating future uses for the dried bark, as well as future foraging and rambles. 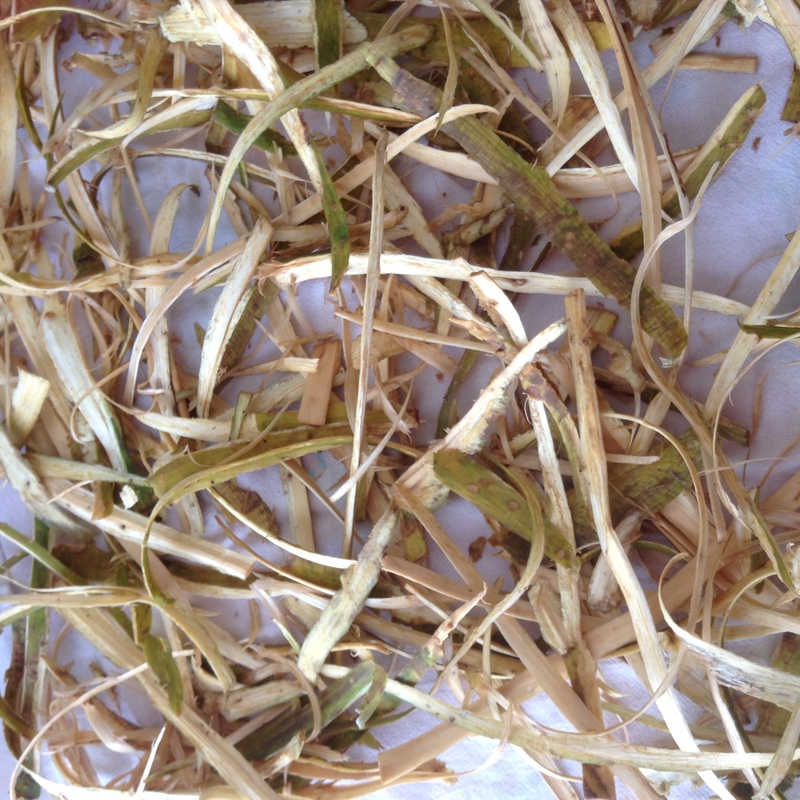 Drying strips of the inner bark from Devil’s Club root.